Artful Affirmations: Tea Cup Tuesday Chintz! Your chintz is beautiful! I love that tea pot. I just love the pattern and colors. Thank you for inviting me to Tea Cup Tuesday. 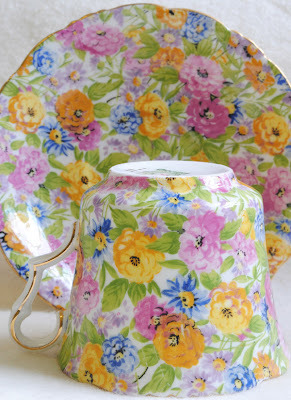 I love chintz, but I don't own a piece yet. I have alot of yets to go. I love chintz, too. Your teacups are gorgeous. That teapot is 2die4!! I love it. Drop in to see what I found while out snooping this weekend! Terri, your teacups are so beautiful! I love the sweet spring-y colors, and all the pretty flowers! HELLO! Now you are speaking my "chintzy" language! You sure have some beauties in your collection!!! 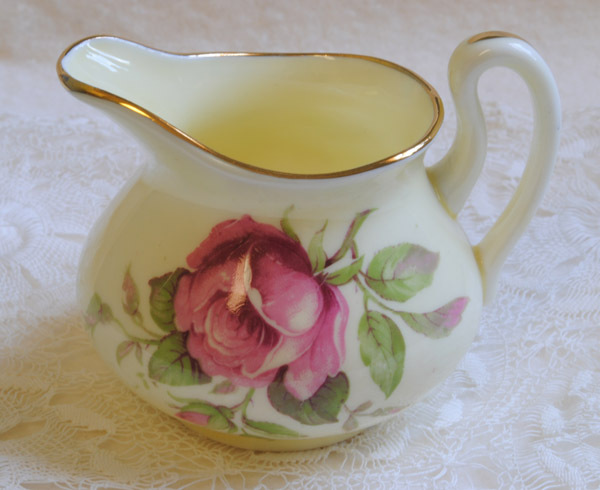 Hello Terri :) Your Chintz teacups are just lovely, but I am really loving that sweet little creamer & sugar you have!! I just love your chintz tea cups . the colors are fabulous!! But the sweet sugar and creamer are just beautiful!! I love the roses on them!! Gorgeous!! I just adore your chintz cups and saucers! Thanks for the lesson on how it came to be too! I just must get me a cup like that!! Terri, your chintz teacups are simply lovely! I adore chintz myself. The tiny creamer and sugar are sweet too. Lovely pieces, all of them! Thank you for sharing them with us. Happy Tea Tuesday! I love chintz, and yours is so pretty. 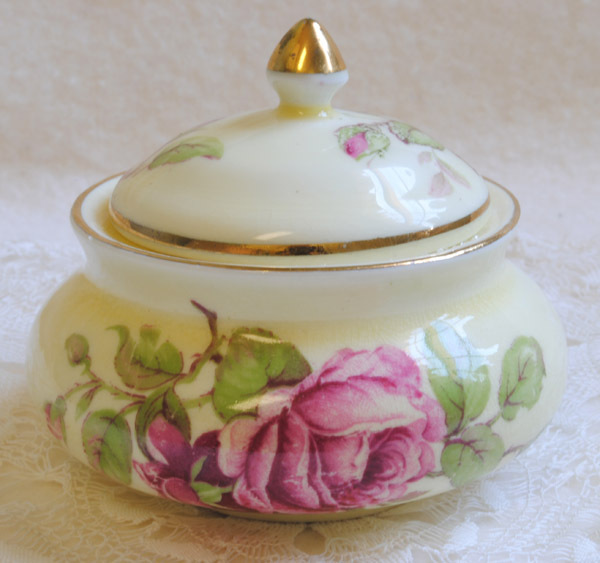 Chintz is my favorite and I own a few pieces, but it's very spendy, as you probably know. I'd love to have more of it! I don't have any chintz at all, but I have always loved it. Yours is quite beautiful, what a collection you have! I love all your pieces this week - as I do every week!! I dont know much about Chintz but have 2 teacups this week. I enjoyed your special treasures as always! 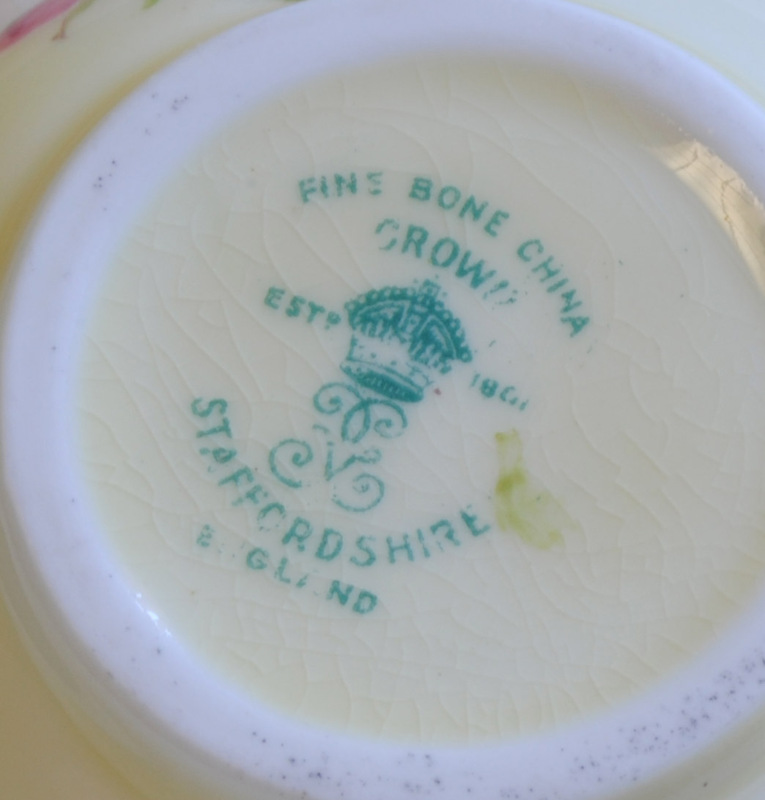 I especially like the Collingwood teacup. The colors are so cheery and also , in spite of the many colors, this cup and saucer would fit in with so many table settings because the colors go well together and would compliment almost any set of china. Well, any set in my home, which consists of a lot of blues. I always learn something here Terri, thank-you. 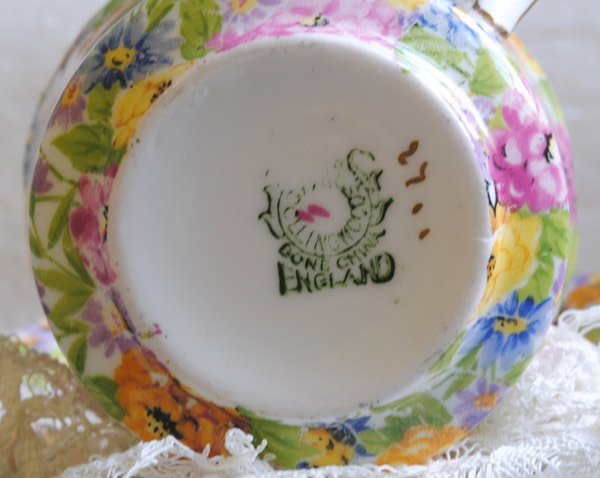 And again, thank-you for hosting Teacup Tuesday. Lovely. I only knew part of the history of chintz before. Thank you for filling in the blanks. Your little creamer and sugar set is precious. Take care. I love chintz but have only one lone cup. I just haven't had time to search for more because I have been loaded with other cups. Oh, so many cup wants! Your things are pretty; I like the soft chintz best. 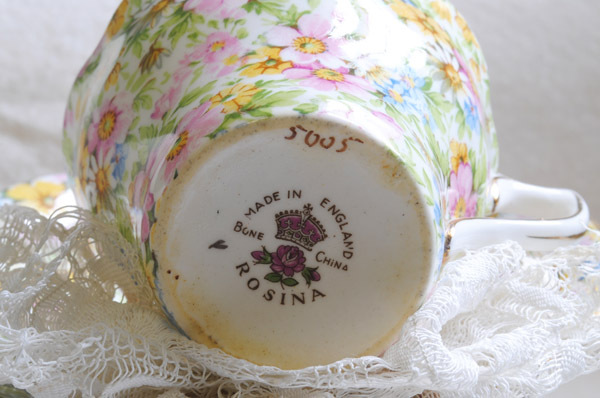 I remember being drawn to my Grandmother's chintz teacup - I thought it was so pretty. Love your creamer and sugar. All your teacups are beautiful, Terri. 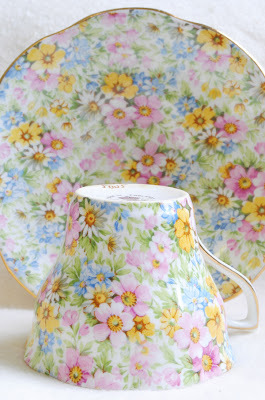 I love your beautiful Chintz teacups! I have many teacups and saucers that I've collected over the years, and thought I'd try to join your Teacup Tuesday gorup today! your chintz is amazing. I do not own any chintz cup but looking at your adorable cups you are making me eager to start collecting cups with chintz decor. also your creamer and sugar are delightful. would certainly look good amidst my mismatched china. Oh I LOVE chintz and yours is WONDERFUL! BUT my "VERY FAVORITE" is that delightful little creamer and sugar bowl, LOVE,LOVE,LOVE that... It would be so sweet on a breakfast tray!!! Beautiful tea cup! I love looking at your collection. Your knowledge of your collection is also impressive. Thanks for sharing. 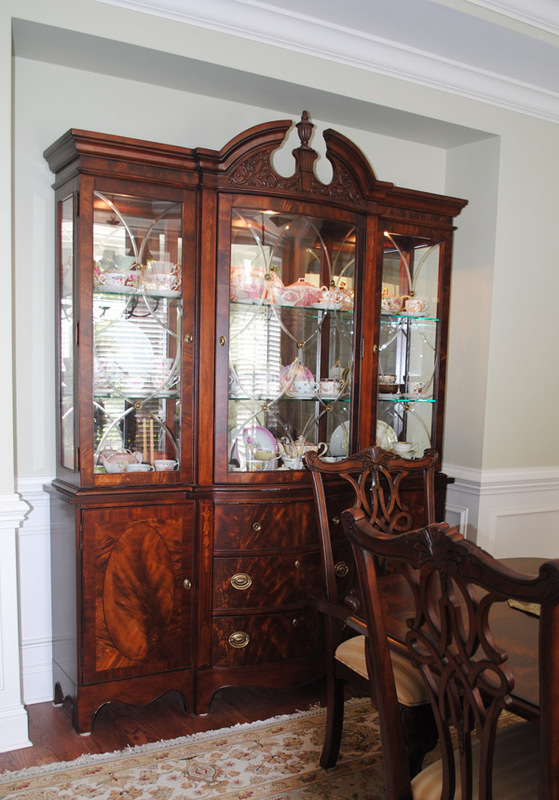 A spacious hutch has been on my wish list for a long time - yours is lovely. 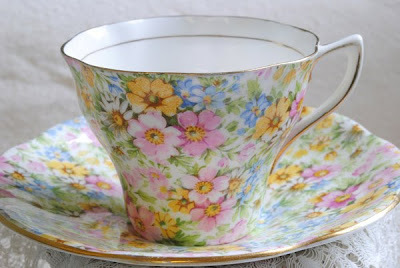 I really like the beautiful chintz teacups. 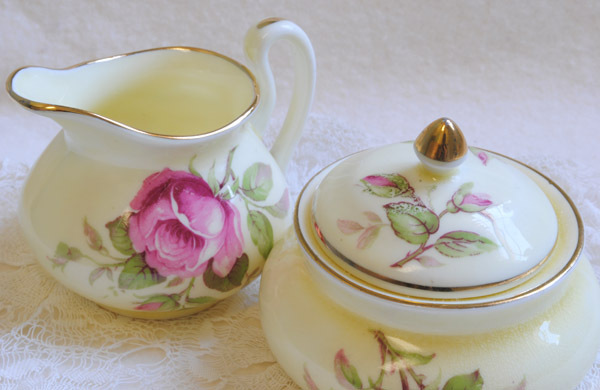 That cream & sugar set is very pretty and the perfect size for a tea tray for one. I am drooling over your Chintz! what a darling set...and soooo beautiful! Thank you for sharing your lovelies with us! That is such a lovely collection, the colors are so rich and joyful. The sugar and creamer make a very nice complement to the chintz. 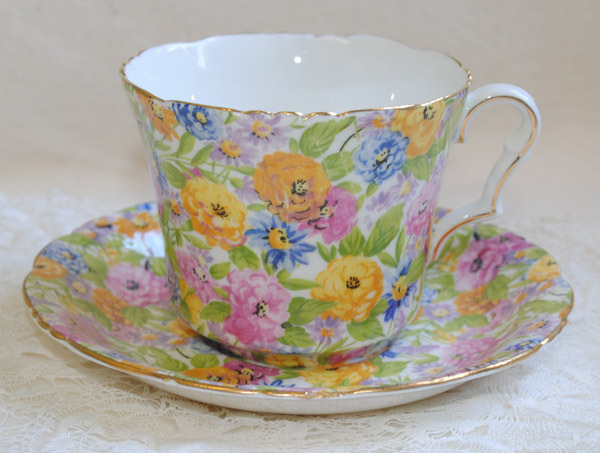 The chintz tea cups are so beautiful. I have one cup that is not that old but I still love it. The cream and sugar would have to come home with me too if I saw them. 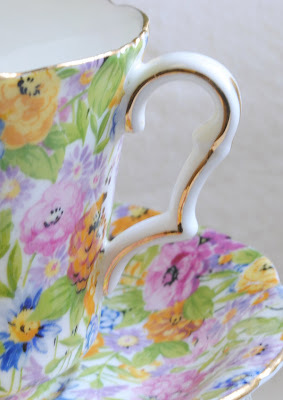 Yay..so beautiful Terri..i love chintz..there is just something so cheery and sunshiny about it..always a feeling of harmony with all that color! Wonderful post! Happy Tea~ Have a sparkling day of sunshine! Thanks for your nice words on my blog. Hi Terri - I did not know you hosted a Tuesday Tea Party - I am excited and looking forward to linking up again this week! Do have a picture for your parties? I have been gone for almost a month with computer issues - so good to be back! 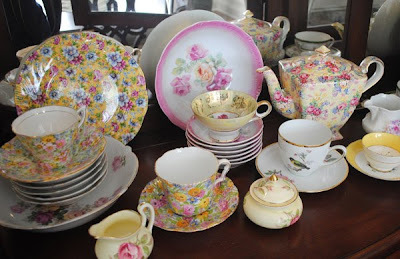 Terri, Those tea cups are so very pretty. I really like the cream and sugar too. You always showcase such pretty pieces! I LOVE chintz!!! And your chintz teacups are totally gorgeous...both of them. I do not have a preference. And, yes, the creamer and sugar are lovely. I would have wanted to take them home with me as well.